On November 24, 1864, 150 years ago today, the recently mounted 24th New York Cavalry ran into trouble with Confederate guerrillas near Prince George Court House, just miles south of Grant’s headquarters at City Point. For most of the Siege of Petersburg up to this point, the 24th New York Cavalry had been one of those unfortunate cavalry regiments which had been forced to operate as infantry regiments in the Army of the Potomac and Army of the James. This was similar to the more well-known instances of heavy artillery regiments being plucked from the Washington defenses and moved into front line infantry roles. Grant was determined to get manpower wherever and whenever he could, and the 24th New York Cavalry suffered as a result. They were assigned to the Second Brigade, Third (later First) Division, Ninth Corps, Army of the Potomac, and fought at the Second Battle of Petersburg, the Crater, and the Weldon Railroad with that infantry unit. Happily for this group, the 24th New York Cavalry were mounted on October 20, 1864 and added to the First Brigade of Gregg’s Second Cavalry Division, Army of the Potomac. I believe the unit participated in the march which led up to the Battle of Boydton Plank Road in late October, but the casualty reports list the unit as having suffered no casualties whatsoever. After the battle, the unit was assigned to the more mundane task of rear area picket duty in November 1864. As the sole remaining cavalry division belonging to the Army of the Potomac, Gregg was responsible for picketing the massive distance from the left of the army near Hatcher’s Run back through Prince George County all the way to the James River near Grant’s mid-June 1864 crossing point. Gregg necessarily had to spread his men thin. The 24th New York Cavalry was posted around Prince George Court House, the county seat of Prince George County. 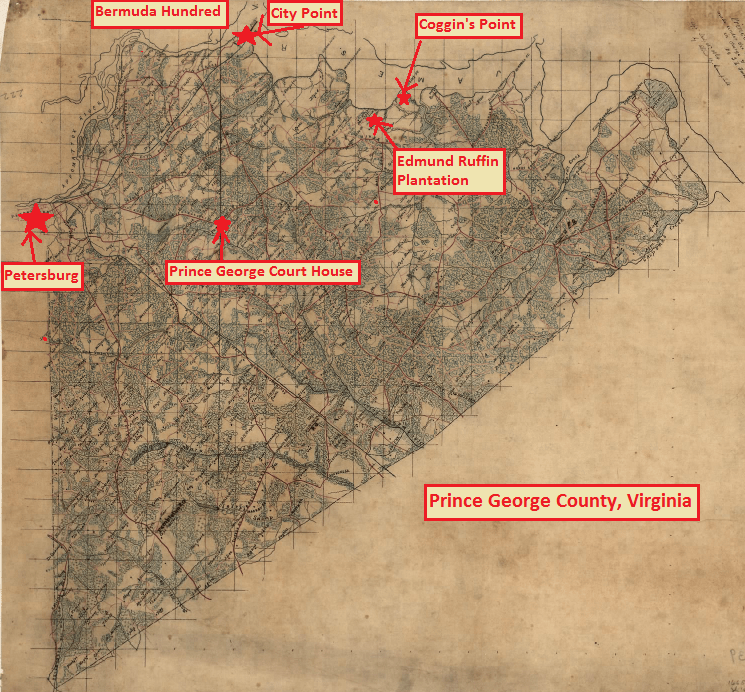 In addition to Prince George Court House, this county contained City Point, Grant’s Headquarters and main supply depot during the Siege of Petersburg. The city of Petersburg was located just west of its northwest point, and it was bordered on its entire northern face by the James River. The county was also the scene of Hampton’s famous cattle raid of mid-September 1864, which occurred near Coggin’s Point. Fire Eater Edmund Ruffin maintained a large plantation near Coggin’s Point, and experimented in new crop growing techniques for which he was lauded. But enough about the county and on to the skirmish. On November 24, 1864, Colonel Walter C. Newberry’s 24th New York Cavalry was picketing a line near Prince George Court House, watching for any potential incursions in to the area behind the main Union lines facing Petersburg and the supply area near City Point. Captain Charles A. Taylor and his Company E were picketing an area near the Calhoun House when a party of about 30 Confederate guerrillas attacked. The pickets must not have been very alert, because the Confederate raiders managed to kill 2, wound 4, take 1 man prisoner and make off with 18 horses. The Confederates were estimated to have suffered only one killed and one wounded. Brigade commander Henry Davies, Jr., after learning of the affair, sent an unnamed battalion after the guerrillas in an unsuccessful pursuit. As the din of the small fight faded away, the question of who was responsible for this failure arose on the Union side. The sergeant in charge of the picket post was killed in the small affair, so he couldn’t take the blame. Davies mentioned in his report that Colonel Newberry blamed Taylor for the affair, and planned to prefer charges against him. As happened more often than not during the Siege of Petersburg, the Confederates got the better of their Union counterparts in a short, sharp skirmish. To be fair to the Union cavalry, they had one division guarding miles and miles of the Union left flank and rear, and it was difficult to proactively deal with the Confederate threat. So they mostly sat back, as in this case, and tried to respond when attacked. In some cases however, as the recent Scout from Bermuda Hundred into Charles City County showed, the Yankees tried to wipe out the threat in surprise attacks of their own.